It seems straight forward enough – not a new concept by any means. But more often than not, it’s the most common request I receive: to build a Lego computer. This probably goes back years – to around 2011 – when the Lego computer system I built received a lot of interest. Since then I’ve continued to receive a lot of interest in the system, requests for reproducing it for others, building custom variations and so on. The more I thought about the Lego computer over the last year, the more I started wondering how I could design and build a system that wasn’t so difficult to reproduce, one that could be bought by anyone looking for a new computer with a unique twist, a Lego twist. I don’t really need to explain how widespread the appeal of Lego is – we’ve all played with it, and many of us still do. Lego has the power to turn imagined forms into tangible things, conceived in the wonders of your imagination built with your own hands. And it appeals just as much to a 5 year-old as an 85 year-old. But if my goal was to produce a Lego computer system anyone could use, I needed that system to be broadly compatible as well as totally capable of meeting the needs of users in 2015 and for years to come. I wanted to design a system that would be advanced in 2015 but just as capable in 2017 and upgradable, so that it might last until 2020 and beyond. After reviewing numerous systems on the market, I discovered a reoccurring problem with small form-factor systems: they were underpowered or crippled in some fundamental way. This meant that they usually had low-power dual-core mobile variant processors (the type of processor found in tablets and laptops), as opposed to their more powerful desktop cousins. The base amount of memory was often 4GB, with a max of usually 8GB, and it cost quite a lot to upgrade, which you had to do it upfront, as advanced features couldn’t be added later. Furthermore, the systems often had a limited number of ports for connectivity and would rarely feature an optical drive. This left most users with a system that was essentially compromised. Cheaper ($400-500) systems had slow processors and only 4GB of memory; more expensive systems ($800-900) had slightly better processors with 8GB of memory, but they often had limited ports or no optical drive. I wanted to build a system that was small and could sit innocuously and look cool, while also being a fully-functioning computer that any user could use as their main system. I wanted it to be powerful with numerous connectivity options, totally capable of the mass majority of general computing needs. 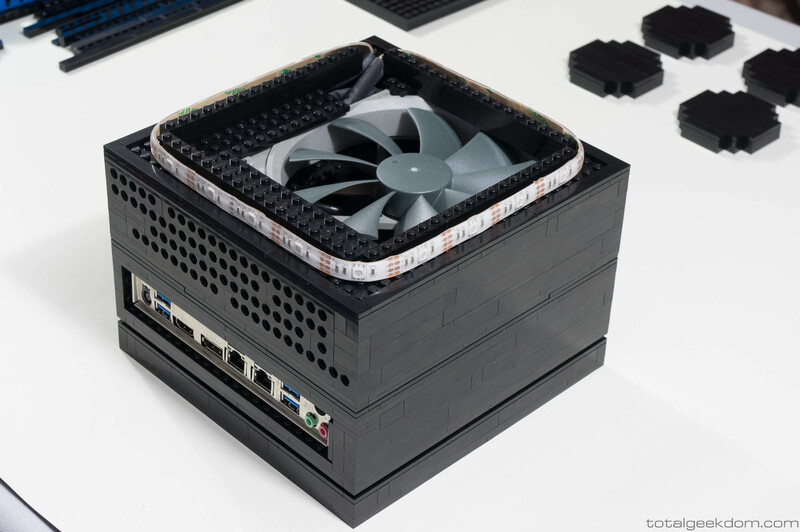 What good is a cool looking Lego computer, if it’s not powerful enough to be used as an individual’s primary computer? With my guidelines established, I started on a completely new system – a system unlike anything I was finding on the market today. I had built previous Lego systems, from smaller home systems to full blown multi-system farms, and one of the biggest assets in my design process was the years of experience I’ve had with building Lego systems. 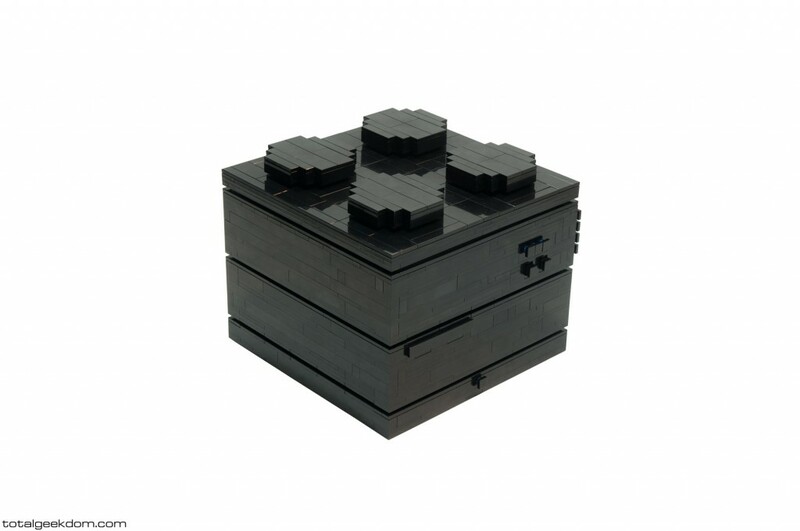 For example, my Lego Folding Farm is a large multi-system computer that housed 3 complete computer systems in one Lego computer case. It allowed me to replace 3 separate desktop systems by merging them into one system, greatly increasing my computing efficiency as well as minimizing the footprint. I built this system for CPU farming, combining multiple CPUs to process medical research data primarily for World Community Grid. With the unique strategy of stacking systems that I developed, I was able to max out all 3 CPUs at 100% with a system that could run 24/7. Having this other system up and running nonstop at max processing speeds for 4 years now gave me a wealth of data to use in building a new Lego system. Taking what I knew from the test system that I had been running for years and combining it with my research on existing systems on the market today, I was able to focus on the items that mattered most to this new Lego computer system and establish a set of standards for the design that I would adhere too. The system must be completely capable of all computing requirements for the vast majority of users. The system should be as intuitive as possible. The system should be designed so that every component (Processor, Memory, Disk Drive, Wireless Card) can be upgraded to add years of usable life to the system. The design must incorporate thermal management to extend the life or all components. Only premium components will be used. These criteria guided my design process from start to finish and sent me back to the drawing board time and time again. If something wasn’t perfect, I tweaked it until it was, and if that didn’t work, I scrapped it altogether and started over again. My Achilles heel is that I’m a perfectionist. Yes, that sounds like a job-interview cliché, and it’s helpful in many ways, but it’s also one of the most frustrating things that I have to grapple with on any project. I just can’t let things go if something isn’t the way I want it. Often, this results in testing a feature or portion of the design and being almost completely satisfied with the exception of one little tiny thing, and that one little tiny thing begins to bother me and bother me… until I have no choice but to find a fix. In designing this system, it went through more iterations and versions than any single project ever before – because if I’m going to sell it to someone else, it has to be perfect. The first concept version that I tinkered with was much larger than the final design. 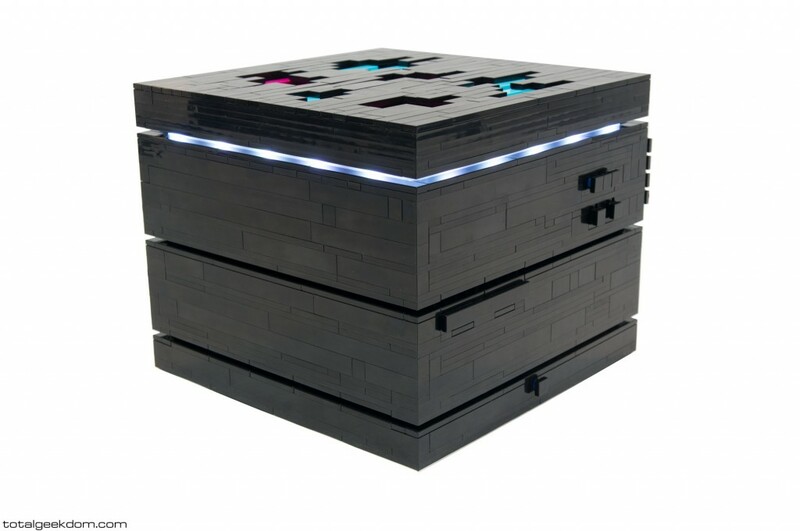 My intention was to produce a 10″ cube, and it incorporated a wire management system designed to move all the connections out of the main system. I really liked it, and it turned out well, but the more I worked on that first concept unit, the more I felt like the size was too big. A 10″ cube is not really that large, but I wanted this system to have a small footprint, and I knew I could go smaller. So the first concept unit was shelved for later development, and I moved on to a new design. The second design was basically a shrink on the first one. I reconfigured the remote wire-setup and moved forward with a size of roughly 7.5″x10″x8″. This system made it further along in the process, and I built it out into a semi-finished state. I tested the system and the new remote wire management design and liked it. During testing of this system, however, I began feeling like I could go even smaller and toyed with the idea of changing the case design to match a Lego brick in scale. Midway through testing, I stopped development on this design and started over again. The third design was the ticket. I shrunk the system down to a finished dimension of 7.5″x7.5″x5.5″. This was as small as I could go and still fit the motherboard. 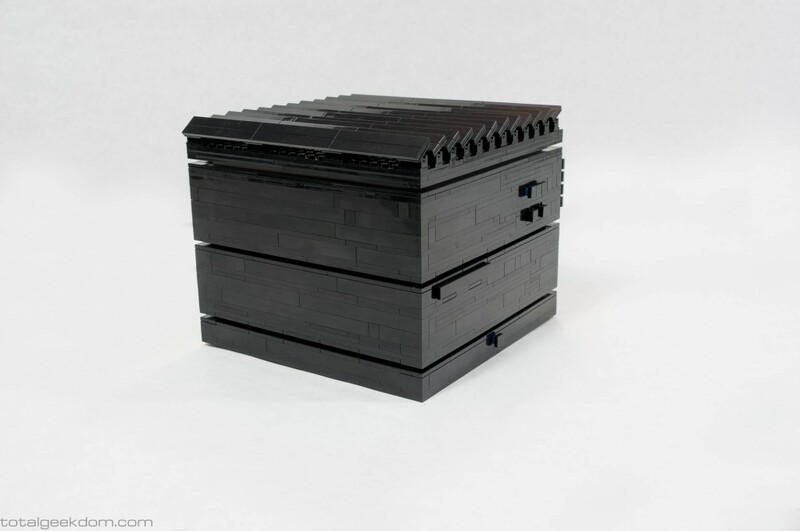 This sizing allows for almost perfect scaling of a 2×2 Lego brick at roughly 12 times its scale. The third design was initially built with the intention of having the air-exhaust holes in the front of the cube with the fan in the top. There were various reasons I chose this arrangement, and in testing the system, it performed very well. However, I didn’t like the look of the front of the case. While the louvered effect was neat, it took away from the overall aesthetic of the brick. After much deliberation, I decided to move the front air-exhaust slots to the back. This, of course, required taking the system completely apart in order to make the change. This wasn’t a prospect I was excited about, but I knew the look of the system would be vastly improved if the airflow were in the back. This is how I came to finalize the design that you see before you today. A big factor in the design of this system was figuring out the thermal management. As anyone familiar with or involved with electronics will know, heat is the primary reason the electronic degradation. So, as with all my projects, for which I often find unique ways to utilize excess heat (Bio Computer) or develop new cooling methods (Wind Tunnel Computer), it was very important to me that the design incorporate active air cooling. Conventional tower computer systems bought from big box stores get away with whatever the minimum requirements are for cooling. In most cases, this is a single fan in the rear of the computer that draws air through the whole system from a grill on the front. The downfall of this system is that it is passive in the way it cools most of the components. It’s basically just an air exchange system, with fresh air being drawn into the case to cool the components before it’s sucked out of the rear of the case. It’s not a bad system, but it can certainly be improved upon. The system I came up with for the Lego computer draws in air that is blown onto the motherboard from just a few inches away. The fan is mounted directly above the motherboard and CPU cooler. This system allows all the components of the motherboard to get a constant stream of fresh air blown across them, ensuring that essential computing elements, such as the power management circuitry and chips, are constantly being cooled. After the air is blown over the motherboard and CPU cooler, it moves to the upper back chamber of the case. 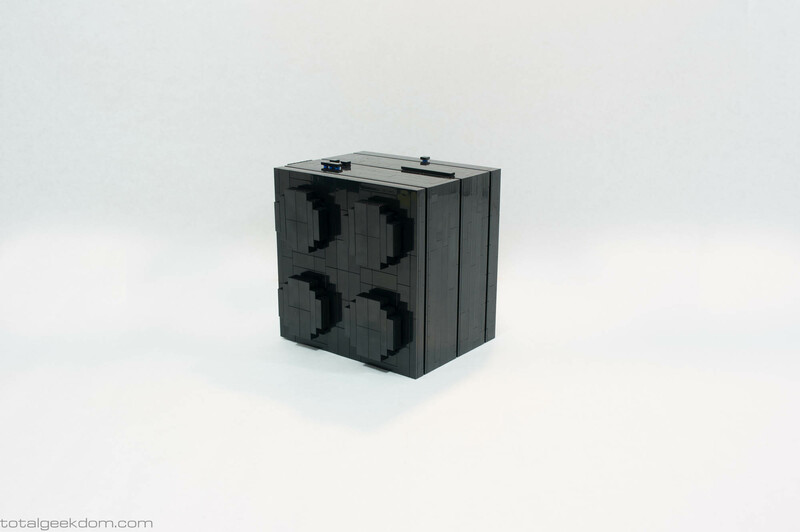 Since the airflow is not comprised of direct fresh air at this point, this area of the case has no electronic components that require cooling; it’s just Lego. The whole upper back portion of the case is built to contain small holes that allow for heated air to exit the case, completing the airflow cooling system. In addition to the upper air inlets and rear exhaust holes, there are two perimeter grooves that pass entirely around the case. On the outside, they look like they are there for aesthetic reasons, but they are far more functional. Behind the recesses lies the same Lego pieces that provide the holes for the exhaust, allowing for another path for air exchange to help cool the system. The fans I chose for this system are not the cheap fans you would get in most big box computers from the majority of computer suppliers. These are very high end Noctua brand fans, renown in the computer building community for their combination of high airflow and low noise and excellent life span. They cost 5-6 times more than regular PC fans, but the price difference is completely worth it. They allow the system to be very quiet while still providing excellent cooling. They also outlive most systems. Both the CPU cooler and its fan, as well as the system fan, are made by Notcua. The air inlet fan, mounted on the top of the system is 140mm, is much larger than the more common 80mm and still larger than the also common 120mm fans. This allows for a lower fan RPM with more cooling power in comparison to smaller fans, resulting in lower noise levels. The upper air intake is designed to incorporate inlet air from the top of the system and is concealed in the various designs available for the top of the system. The cooler for the processor is based on more expensive and advanced technology than what is sold in big box computer systems. It is a heatpipe cooler that features hollow heat pipes filled with a liquid coolant that moves heat by evaporating and condensing in an endless cycle, providing more effective thermal transfer and cooling ability than the aluminum heatsinks that are typically used for processor cooling. (Note) I received a lot of questions in regards to the airflow and direction being top down. 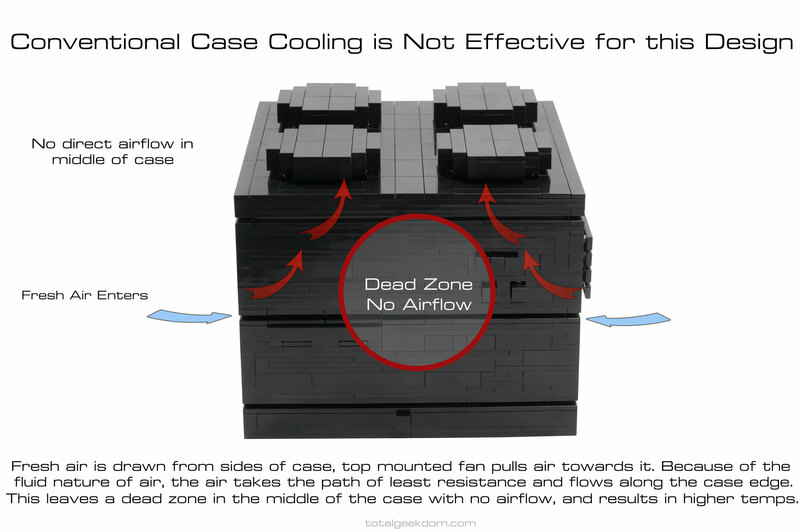 This section mostly explains the reasoning, but to be a little clearer I’ve added some illustrations showing why conventional case cooling is not effective for maximum cooling. Yes, heat rises, and in a conventional case that has a a large air volume (desktop case) airflow is designed to work with convection. Also because it’s cheap and suffices. But in this system I wanted to employ a much higher performance cooling system. I wanted direct airflow across the entire surface of the motherboard, that is why the cooling system is designed the way it is. In a large volume case with low airflow (most standard desktops) there is minimal airflow in the case, usually just enough to exchange the heated air for fresh air. 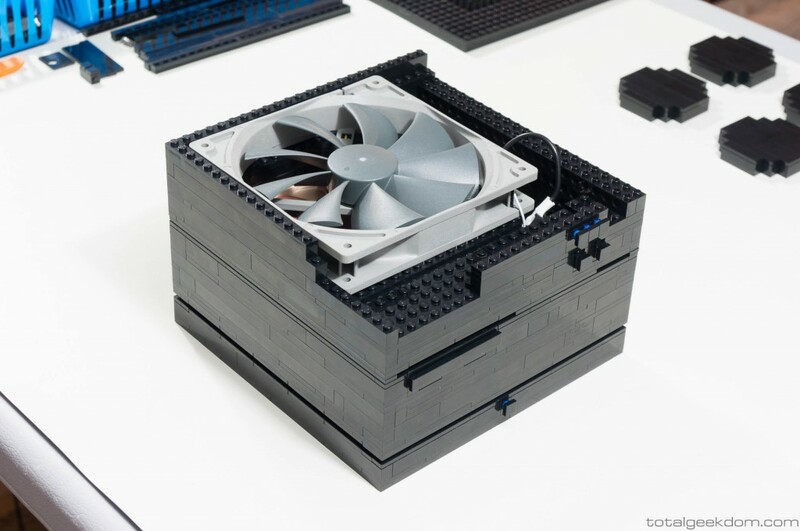 In the Lego Computer the case volume is almost 20 times smaller than a normal case, and when coupled with a large high flow fan this creates a very efficient system for quickly moving fresh air into and out of the system, cooling all the components. The best analogy I can think of is to imagine a regular computer case as a refrigerator in size, but using just a single 12″ box fan for airflow. You can probably see how that wouldn’t create a lot of airflow in a space that size, you wouldn’t really even feel it in most of the refrigerator. Now imagine that same 12″ box fan, but connected to something the size of a desktop computer. You can probably imagine how much more flow you would feel inside that much smaller space with the same size fan. I went through and tested the various arrangements for flow during development. Using an infrared temperature gun as well as surface probes on the components, I tested the temps with each of the airflow arrangements (top-down flow, bottom-up flow, cross-flow). The most effective system was top-down flow, it resulted in the lowest measured temps. This direct airflow approach and case design is the most effective for cooling all the components. In keeping in line with my desire to have this system fully capable for the majority of users, I wanted to use a processor that wouldn’t struggle to keep up with regular to heavy usage, light to medium gaming and HD video playback. A lot of small form-factor computers use dual core processors, and while these are not bad processors, they don’t really offer a lot of performance for more than just basic use. I decided to incorporate a dual core Intel i3 processor (i3-4160) for the base system, so that users that didn’t need a lot of processing power had an option. For users that need more power, however, the quad core Intel i5 processor (i5-4590s) and the even more powerful high-end quad core Intel i7 processor (i7-4790s) are also available as options. 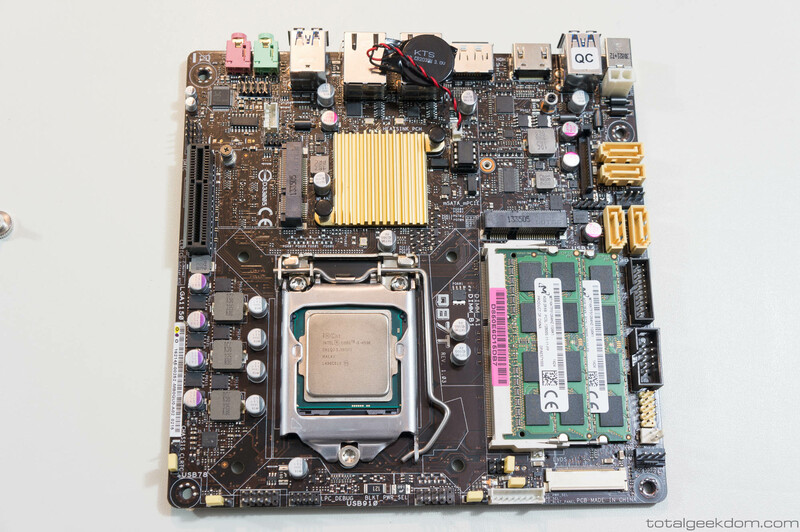 These processors are the latest 4th gen Haswell processors available for desktop use. In comparing a lot of small form-factor systems, I found that other systems used mobile versions of these Intel chips, generally due to their ease of cooling. Their downfall, of course, is that performance is compromised with these chips in comparison to their full-power counterparts. 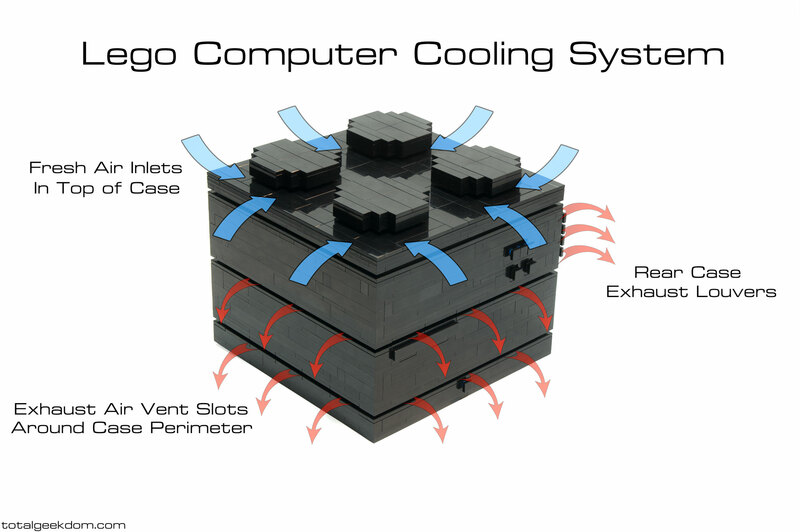 It was therefore imperative for me that my Lego system was not compromised, and its unique cooling design made it possible to incorporate higher-performance full-power processors. In a lot of contemporary desktop systems and smaller form-factor all-in-one systems, memory is kept at 4GB in the base configuration. While that will work for light usage, it’s really not enough these days. Outside of increased affordability, there is no justification to buy a system in 2015 that has less than 8GB of memory. For this reason, the base system configuration of my Lego system comes with 8GB of memory with a 16GB option. I didn’t want to sacrifice any performance in terms of system storage, so I went with SSDs as the primary storage drive. Solid State Drives (SSDs) are vastly superior to mechanical spinning disks, offering much faster read and write speeds and almost instant seek times. 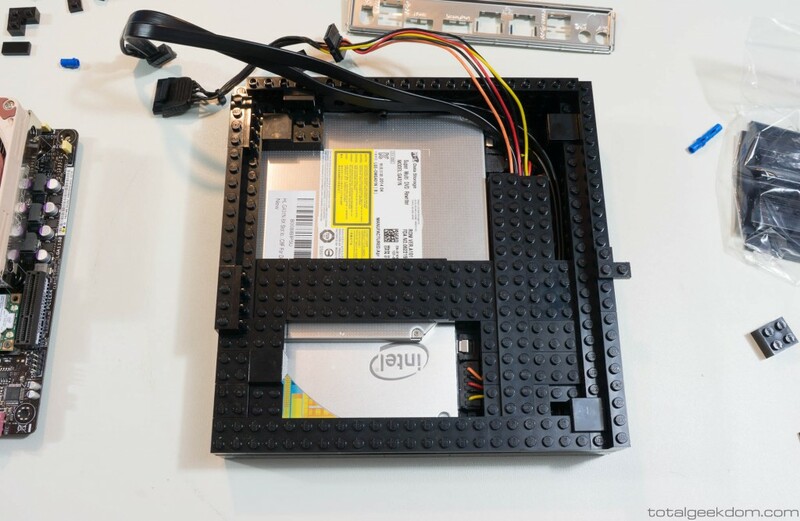 I chose to use the on-board mSata port on the motherboard, which in the base system can be configured with a 120GB Intel SSD, and if desired, larger drives are available, all the way up to 1TB. In addition to this drive, there is also space for a secondary SSD/HDD drive. Built into the lower of the case, this option allows for either a secondary fast SSD drive, or a conventional HDD drive for storage. The secondary drive also allows for sizes up to 1TB. Allowing for dual SSD gives the benefits of very high performance. 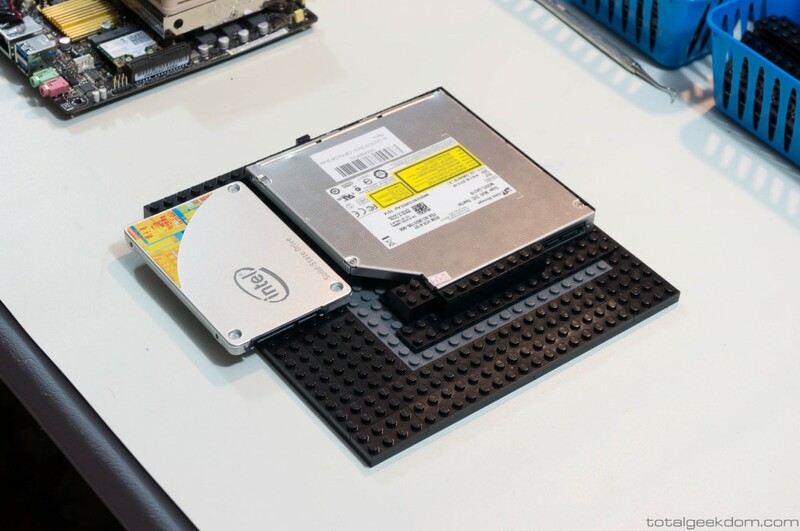 While there are drives that are slightly faster than the Intel SSD drives, their performance is only marginally better at a slightly higher price point. Affordability and durability were both considerations in developing this system, and the Intel drives offer an outstanding 5-year warranty. 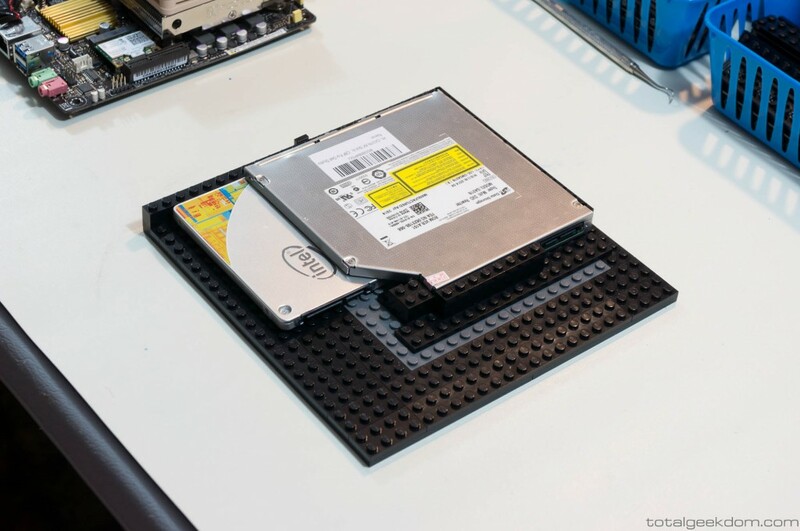 While more and more frequently optical drives are becoming replaced with USB flash storage, optical drives are still essential for many computing tasks, and not having one can be frustrating and time consuming. I therefore outfitted this system with a discrete DVD/CD combo drive for reading and writing optical discs with the option of Blu-ray drive as well. In order to ensure that the Lego Computer was completely stable, I spent considerable time testing the system. This involved using various stress testing applications and running the system continuously to ensure reliability. These stress testing applications work by maxing out the processor, memory and graphics sub-systems at 100% utilization for up to 24 hours straight to ensure reliability. The Lego Computer passed all tests with flying colors – literally, because of the LEDs. Once all the design, building, re-building and testing was done, I finally had a finished Lego Computer that I was happy with – even if it took longer to complete than I originally planned. Being pleased with the final product was so much more important to me than the endless hours I spent tinkering. And I’m happy to say that I’ve met all of my initial criteria – and then some – to produce an affordable, durable, reliable small form-factor computer system with a unique aesthetic that appeals to a broad audience and is capable for essentially all computing tasks. 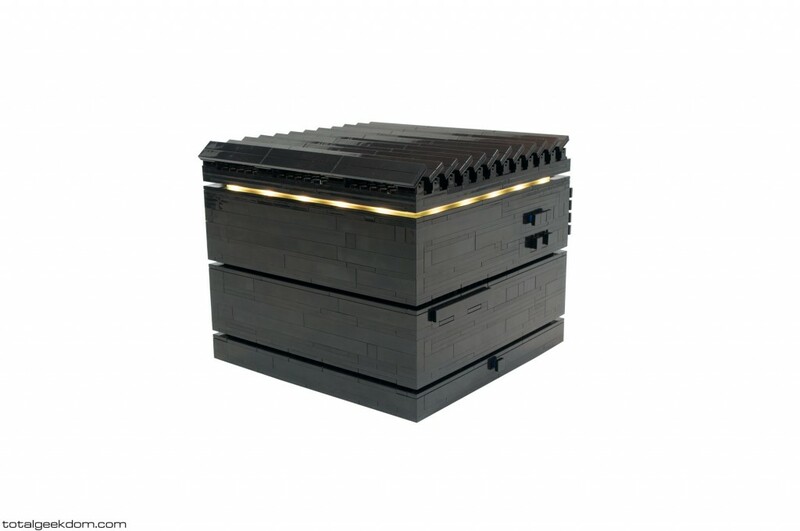 Overall, the Lego Computer has performed exceptionally well in testing, making it one of the most unique, durable and reliable systems on the market. With the Intel Core i5 processor and the 8GB of system memory, it’s capable of handling even CPU-intensive tasks with ease. The system is very responsive, and was able to boot Windows 7 in 5 seconds. Running multiple applications at once never caused any hiccups. Even opening multiple browsers with multiple tabs simultaneously with office software and video playing, I never had any issues with any lag. Video testing also went exceptionally well – streaming from Netflix, Hulu and Youtube were not an issue at all, and Blu-ray movie-playback was flawless with low processor usage. I even tested out streaming 4K content, which also played-back without issue. While streamed 4k is not exactly full 4k content due to compression, the video quality was quite amazing, even on standard HD (1080P) sets. One of the greatest things about Lego is its flexibility and versatility – there really is no end to what you can build. And beyond my inherent love of the medium, the ability to create variations on the design to allow for further customization was a big incentive to use Lego. I therefore chose to design the case in such a way as to allow the top section to be interchangeable. 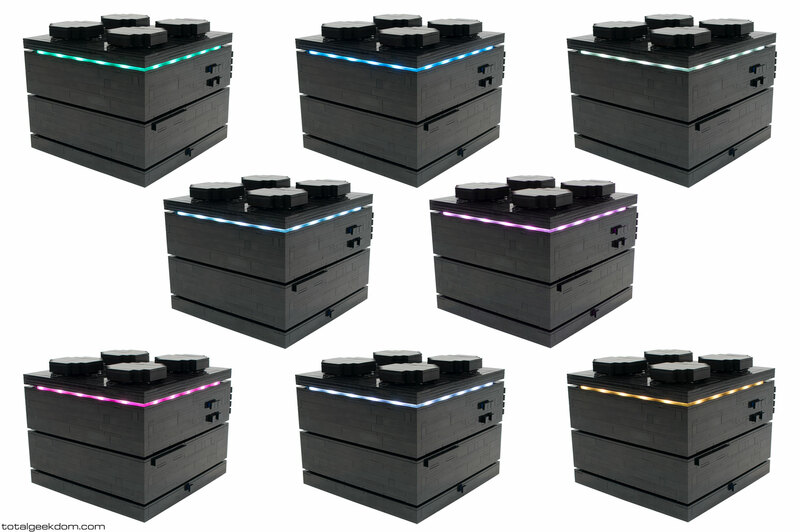 The upper section above the LED light slot is easily removed, allowing for the addition of modified tops to produce a unique look for different system options and flexibility for the users themselves. 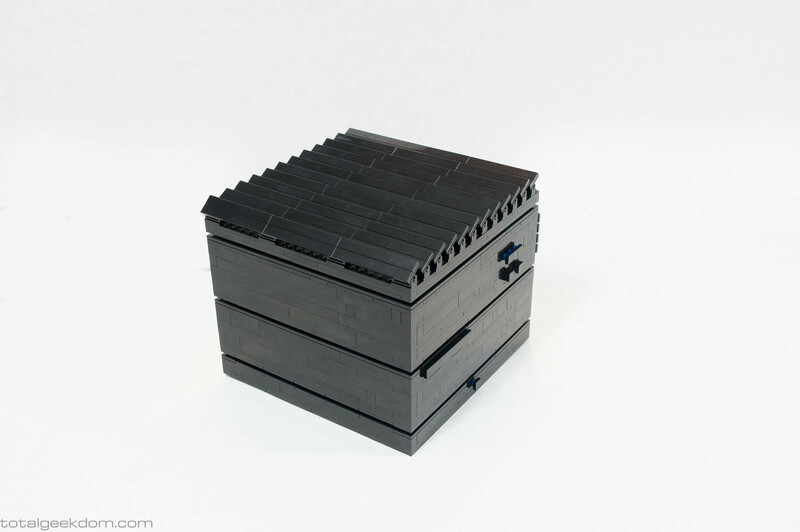 The base section of the system is the same on all systems and standardized, and the standard top section is built to mimic the look of a standard Lego 2×2 brick. 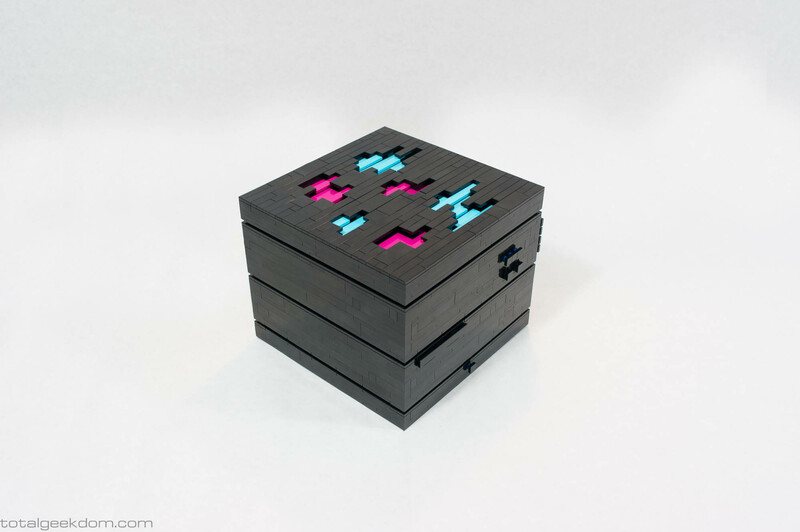 Other top sections, however, are available, and a plain top section is available for purchase, so that users may make their own Lego creations atop their computer system. I created a couple of alternate designs to show just a small sliver of the possible options that could be created for the top of the system. The first design was based on an early idea I had for the initial system, which integrated a louvered vent approach to cooling. By combining various elements, I was able to build this louvered top section with each louver capable of tilting. This design has a bit more of an industrial look to it, and the louvers can be altered to match the user’s preference. The next design was more artistically inspired. 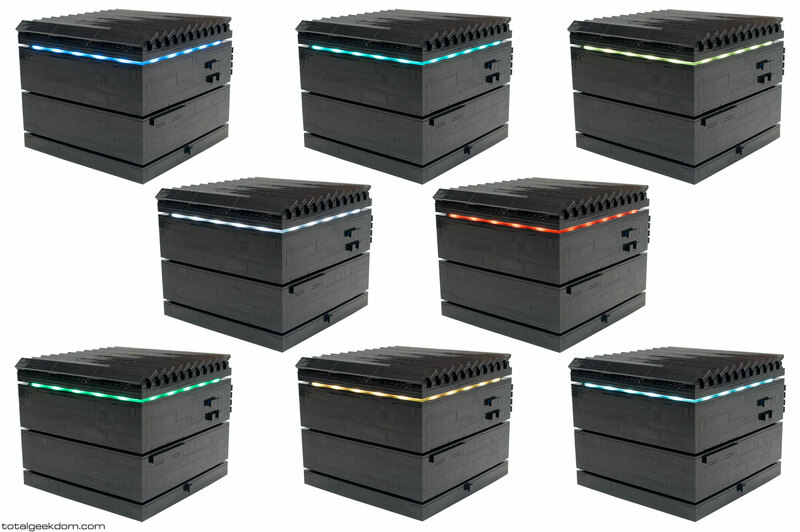 I really like some of the Lego color options available today, and I wanted to create something that incorporated bright colors into the system that could both offset the gloss black and reflect user preferences. I had been toying around with designs for other projects that incorporated depth and overlay into my Lego creations and chose to integrate these strategies into my last alternative top design. The recessed color tiles allow for airflow to pass through the top section to the fan directly underneath it, and the design’s depth and overlay allows for the concealment of these openings. These are just a couple of the many possibilities that exist with the Lego Computer system. Other designs will become available as I continue to create new variations on the top section, and custom designs are available upon request. This is one area where regular computers can’t come close to matching the easily customizable nature of the Lego Computer. 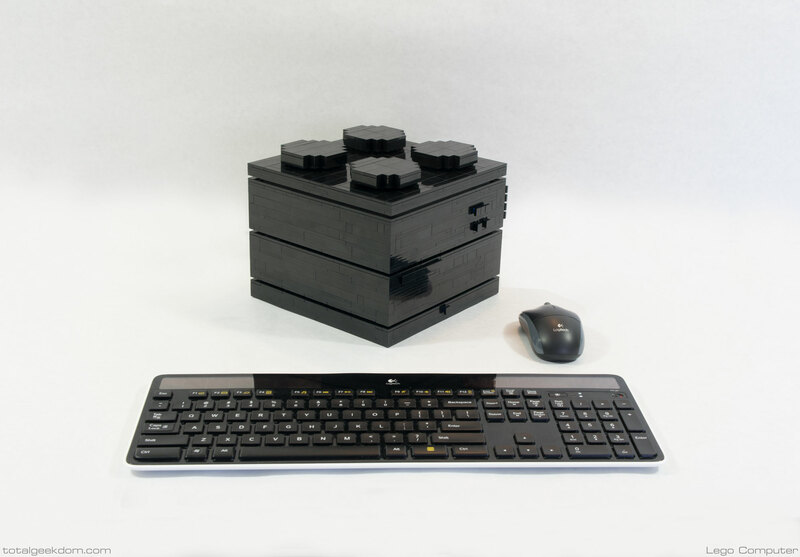 While many computer offer a very limited range of easily customizable options, the Lego Computer offers infinite possibilities. 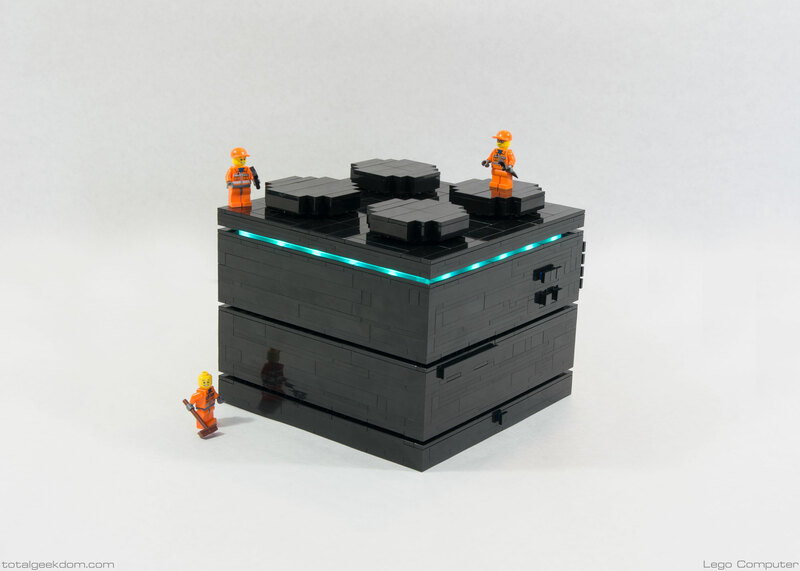 When initially working on the design for the Lego Computer, I wanted to add another element that would allow for easier user customization, something that was subtle but offered a high-tech feel, and I settled on adding an LED light strip. 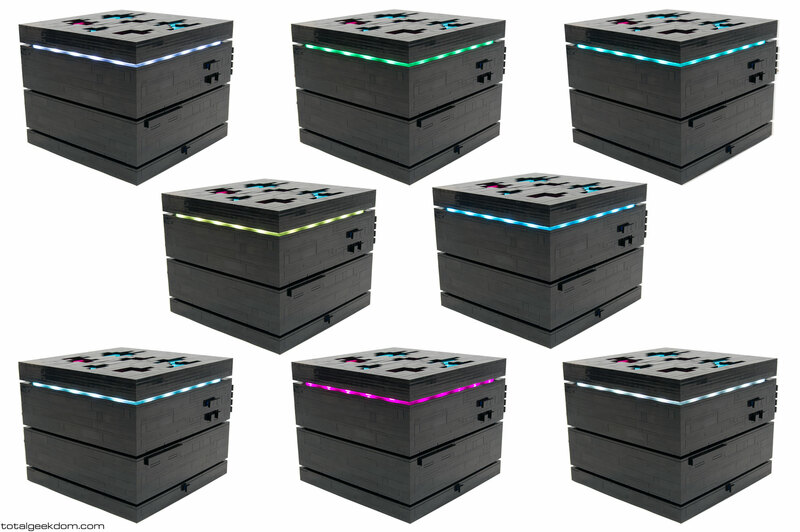 Small enough to not have a big effect on the overall look but would offer a cool effect that users could change themselves, the LED light strip turns on/off and changes colors and functions with the push of a Lego button. With all the variations in combinations to choose from, you can create whatever effect you would like. From a slow cycling through the colors to a more subtle transition through the colors (akin to breathing), from solid color choices to no colors at all (push and hold any button and the system will turn off), there are too many possible combinations to list, but they are all controllable from the push of a couple Lego buttons on the side of the case. Another aspect of my Lego Computer design that was important to me was the possibility of alternate positions. 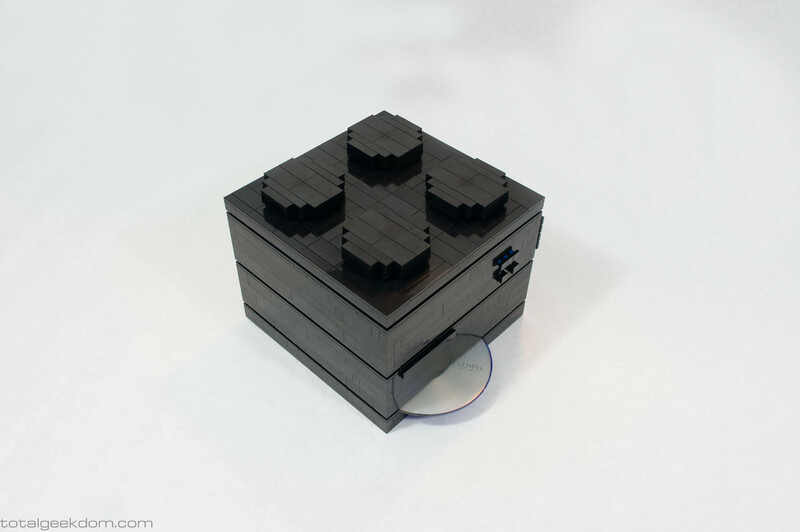 The majority of the pictures show the system sitting on its base, but the Lego Computer is also designed so that it can be stood on its side. I intentionally put the power and reset button, the LED light system buttons, and the DVD/CD drive slot all on the same side, so that the opposite side could function as an alternative base position. Furthermore, all of the internal components of the system are mounted and built into place so that they can’t move of shift. 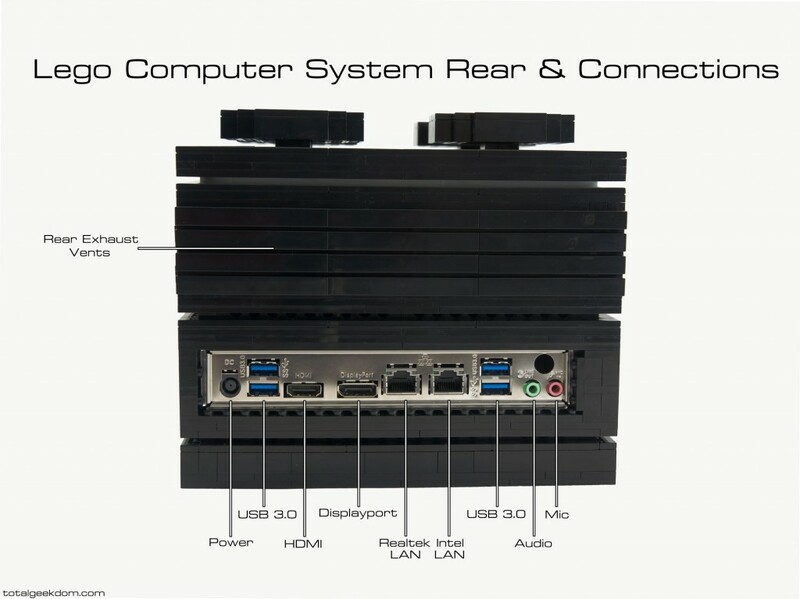 The front USB ports are located on the front side of the system. Hidden under a swiveling Lego tile for easy access and concealment when not in use, the system’s two USB 3.0 ports offer high speed data transfer. The Lego Computer’s standard optical drive is a DVD/CD combo drive capable of reading and writing optical discs. It is located discretely in the bottom section of the case and utilizes the lower airflow slot as its opening, which conceals it in such a way that it’s invisible. With exception of the small Lego button that sits right below the slot, there is nothing that even hints that there is anything there. The button allows for easy ejecting of discs, though you can also eject them through the operating system by clicking eject disc. 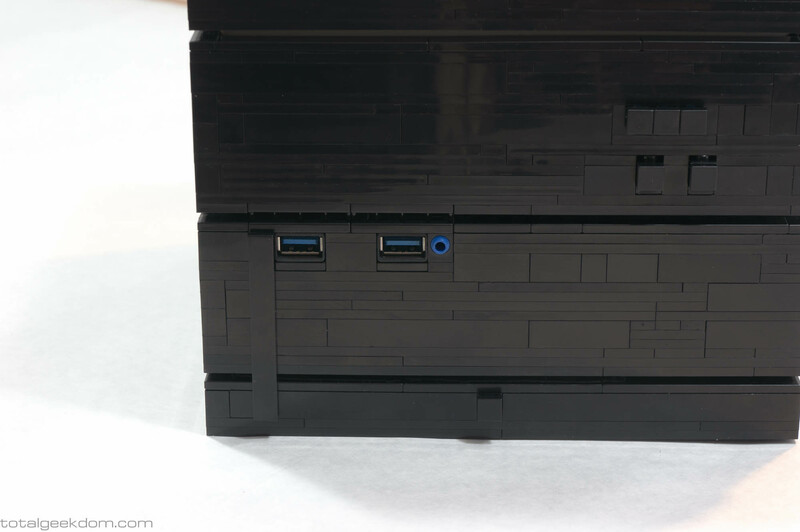 It was essential to me that every aspect of the Lego Computer case be made of Lego bricks, so it took me some time to figure out the system’s buttons and switches. This was surprisingly easy in for some of the buttons and probably harder than it needed to be for the others. 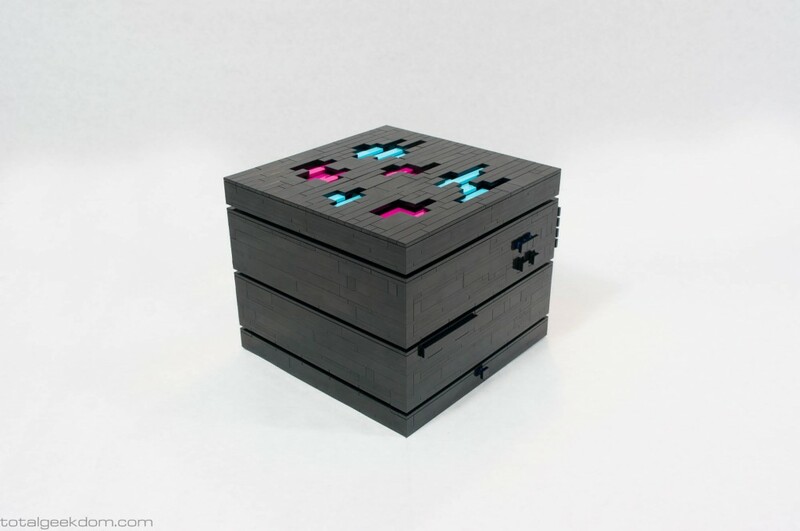 The switches themselves are electronic and housed inside of the case, but the mechanical mechanism that actuates them is made with Lego pieces, which are located on the exterior of the case. Unlike the buttons in most of the pictures, the buttons on purchased versions of the Lego Computer will be labeled with power and reset symbols, as well as color, speed and mode symbols for the LED light buttons. 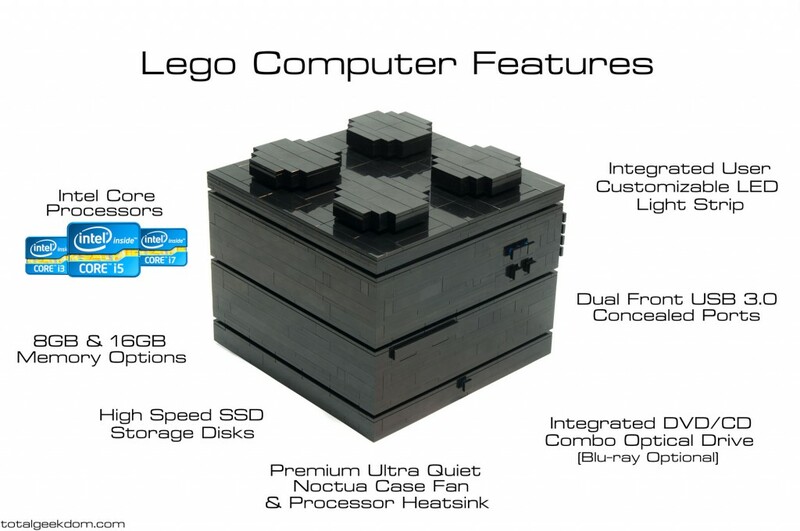 The Lego Computer will be available with a series of different operating system options. For users that want Windows, there is support for both Windows 7 and Windows 8 as options, as well as future support for Windows 10. For those users interested in Linux, there will also be a number of options available. However, if you’re the type of user that would rather install your own operating system, this will also be an available option. I’ve never been fond of being forced to buy an operating system with a computer, as I usually prefer to install my own operating system, so I’m not going to force people into purchasing a required operating system. Is the Lego glued together? How strong is the Lego? The Lego is not glued together. However, the build incorporates many advanced building techniques that greatly increase the strength of the system. Overlapping plates and bricks are used throughout the design, along with supports and beams to add stiffness. This results in a very strong system that can be easily be moved around, handled, picked up, and put down without any worry of causing damage. One of the great features about Lego is that it’s pretty much indestructible. With a regular computer, if you drop it, you’ll most likely break its thin plastic case or dent the metal. 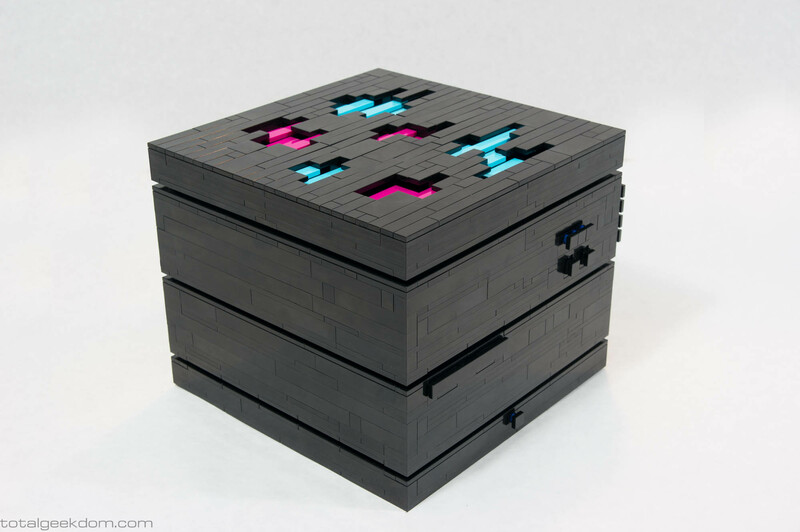 With the Lego Computer, however, if you drop it, it will most likely just slightly deform as the bricks separate a bit – a problem you can solve by just pushing the bricks back together. But in the event that something more catastrophic happens to the computer, and it’s broken into pieces, you can always send it back to me to be fixed. That said, dropping any computer could damage the internal components, so try not to do that. Does the Lego hold up to heat well? 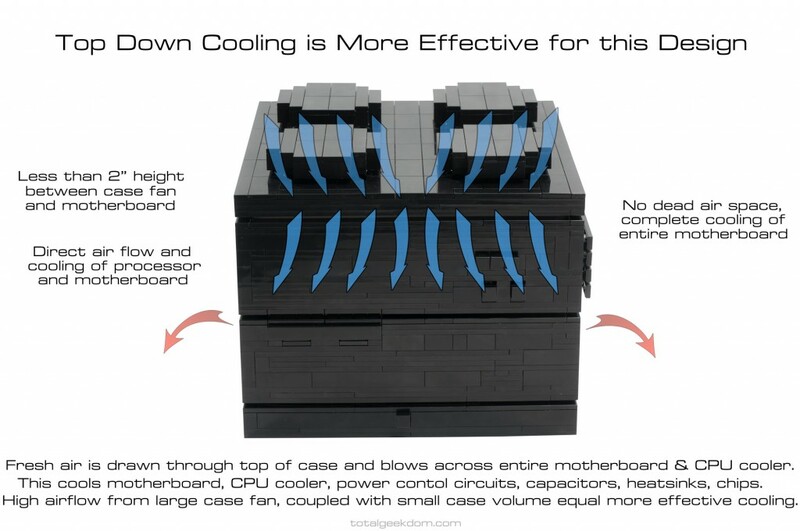 When I built my other large Lego computer years ago (Lego Folding Farm) one of the most common questions was how well does the Lego hold up to heat. Well, the answer is: really well. That system has been running for over 4 years without a hitch. The Lego pieces are still just as tight as when I put them together, as the plastic used in the Lego bricks is resistant to heat and holds up very well. With that said, I would always advise common sense when it comes computing. I wouldn’t leave it in direct sunlight and running at 100% processor usage for days on end. The heat from the sun would rapidly heat the case up – just as anything would heat up in the sun, and the cooling system is designed to account for that sort of temperature increase. Can I play games on the computer? Yes, though the system isn’t designed as a full-fledged gaming system. It is more intended as an excellent all-around performer for multi-tasking and running office software, internet browsers, streaming video, editing photo/video/audio, etc. While light to medium gamers will not encounter any problems whatsoever, the Lego Computer is not designed to be a system devoted entirely to gaming. Up until recently, on-board GPUs weren’t powerful enough for major gaming, but with the Intel 4000 series HD iGPU and its successors that has changed, and general computers have been more capable at gaming since. This system uses the Intel HD4600 graphics unit, which is powerful enough to run most games at playable frame rates. Keeping in mind that you won’t be able to max out the settings on a lot of newer games, gamers using mid-range settings at lower monitor resolutions can totally play most games. However, this system is not designed to play the newest and most graphically intense games, or games at very high detail settings at higher resolutions. If users choose high detail settings, the frame rates in modern graphically intense 2014+ games will not be playable. The purpose of this system was to be a well-rounded performer, capable of fulfilling the needs of the majority of users. 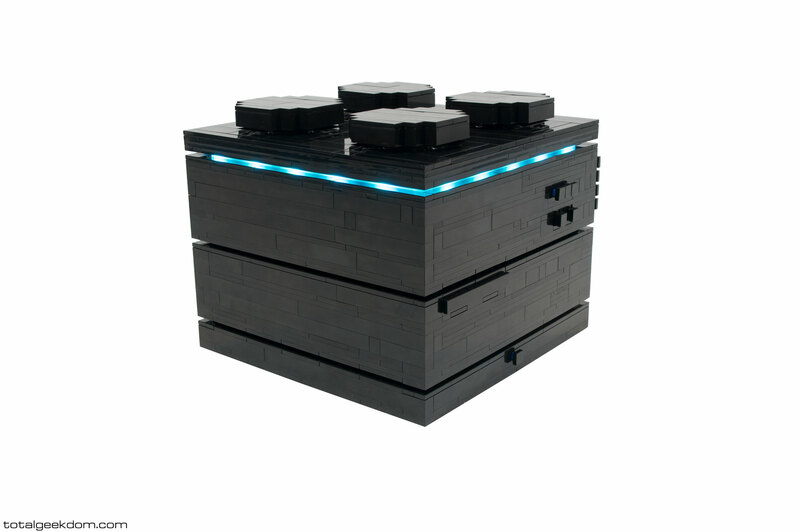 If you are looking for a purpose-built gaming system made of Lego, please contact me personally, as I could certainly build something to suit your needs. Here is a list of some popular games, and how they perform on the HD4600. Keep in mind that these are at mostly stock settings on the HD4600. The HD4600 does have some head room and can be overclocked a little to add some more performance. What good is a computer system without support to back it? That’s the way I look at it at least. I offer support for the computers I build for the lifetime of the system. That means that if you have a question, issues, etc., just contact me, and I’ll follow up and do my best to help. Most support related questions can be pretty easily answered and resolved quickly. If more hands-on involvement is required, I can offer remote support by logging in to your system remotely and trying to fix the problem. Email support for questions, issues, etc. is completely free, remote support will be charged based on the time it takes to resolve the issue. *(Disclaimer) If you need remote assistance and request that service, you will need to authorize and install software onto the computer. The software will be available for access by you but won’t work unless you choose to install it. I know privacy is a big concern for people, and because of this I will not install any software that allows remote access to a system without your permission. This will therefore be the user’s choice and responsibility, if they want this service. How easy is it to upgrade? Do you offer upgrade services? Yes! The system was designed with the intent of being fully upgradable. It was very important to me that the Lego Computer system be capable of supporting numerous hardware and software upgrades to extend its years of service. Every single component in the system can be upgraded. The processor, memory, SSD drives, wireless card, and even the motherboard itself. This could add years to the life of the computer by just changing out components in the system. I do offer upgrade services and can upgrade any of the components in the system for increased performance. Most computer systems available today have limited upgradability, allowing only for upgrades in storage and sometimes memory systems. This is often tied to the fact that most of these systems require software and firmware updates in order to utilize new hardware, and the manufacturers only support these software updates for a short period of time in some cases. Another factor is that these retail systems often are built with hardware specific to the chassis and can only accept very similar hardware available at the OEM level. This is where the Lego Computer is different in its approach. I have only used components that are retail based and have purposefully built the system using a standardized form-factor. This means that all the components can be updated as new technologies become available. I don’t write firmware or software for the system because I don’t have to; the components have their own suppliers that do that. So when that component reaches the end of its life, the system allows jumping forward to the next iteration. You can send your Lego Computer back to me, and for a reasonable price, I will upgrade components based on your needs. Do you have an affiliation with Lego? No, I have zero affiliation with the Lego® group. I do not work for them, represent them or sell products for them. I am just a fan of Lego – a huge fan. You could probably even call me a super fan, as I have loved Lego as long as I can remember and have never stopped playing and building with it. In particular, I am a 80s space-themed Lego nerd, who gets wildly excited by anything M-Tron, Blacktron or Space police. I’ve built so many different Lego sets and custom things over the years that I could never hope to remember them all. In my house alone, I’ve accumulated over 40,000 pieces of Lego. It’s taken decades for this to happen, but I just can’t help it. But while I’m a huge fan of Lego and love building and creating things with Lego, I have no affiliation with Lego in anyway. If you're interested in following along with new updates, pics, designs, models, and info related to the Lego Computer, then click the button below to head over to my newly created Facebook page. There you can Like and follow Total Geekdom and see updates on the Lego Computer. For information, pricing and options visit the Lego Computer page.